For this particular factor we will be looking at the availability of oil for gasoline and lithium for lithium ion batteries. These two materials are the basic building blocks that create the gasoline or are used to create the batteries that store electricity. The first up will be gasoline and the oil used to create it. At the the start of the oil age it was considered to be a energy source of unlimited bounty that would never run out. As time went on we began to understand oil and how much was actually available to us to power our lives. We could discover yet more oil that can be pumped out of the ground and used. The global usage will increase with China, India and other growing countries demanding more oil as time goes on. Those two factors could dramatically shorten or lengthen that figure and it's really impossible to tell at this time how long it really will be. Since we don't know for sure I am going to operate on the assumption that we will have oil available for gasoline for the next 53 years. Since we know we will have gas for the next 50 years or so and in the US there is a gas station around every corner we can assume that it is available 100% of time. In renewability however the gas powered devices are not scoring high in any way as they are powered by a fossil fuel that once used is gone. Credit: http://large.stanford.edu/courses/2010/ph240/eason2/Lithium is a silver white metal that has unique properties that make it ideal for many applications including the production of high energy low discharge batteries. Lithium is found all over the world in brine water, clay's and certain types of rock. To date there is a expected reserve of lithium of up to 28,048 500 million tonnes according to the the Roskill 2008 Report. According to Stanford University, the annual use of lithium is currently at around 20,000 tonnes per year. So by taking the expected available reserves and by dividing it with the current usage rates we have around 1400 years of availability. But like gasoline and oil, lithium will be subject to the forces of increased demand and the potential to find more of it. As for renewability the lithium does do better than its gasoline counter part. It is expected that by 2040 that up to 50% of the lithium that goes into new batteries will be recycled. On the other hand when gasoline is burned in combustion engines it is simply broken down into many different types of compounds and carbon. How much pollution a mower produces is heavily dependent on the source of energy it uses. A typically mower obviously uses gasoline for its energy and with that comes a lot of pollution. A standard mower will produce 88 lbs of CO2 and 34 lbs of other pollutants per year. If you take into account that 54 million plus people that mow their lawn in the US that is a lot of CO2. Now if you look at electric mowers they will produce according to some older data that I found around half the carbon dioxide emitted by gas powered mowers. This can be directly traced to the higher pollution and emission regulations that effect power plants. So by using a electric mower you will be using a form of energy that over all produces less pollutants than its gas powered counterpart. You can further reduce this by charging your machine with solar or wind power. While solar and wind do produce pollutants during their manufacturing once they are in place the pollution they produce is negligible. When you use a lawn care machine like a mower or a weed whip you care a lot about how effective it is at its job. 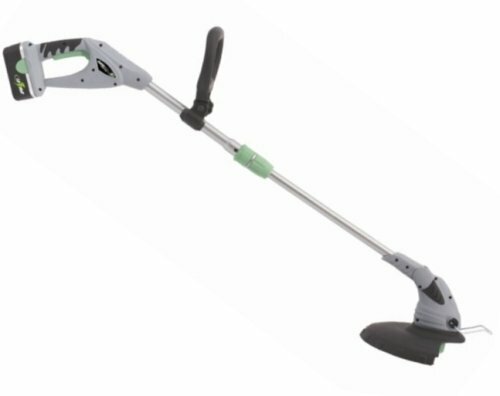 There have been quite a few tests done on the effectiveness of electric powered weed whippers and mowers versus their gas powered counterparts. One of the main conclusions to come from these tests is that the amount of work that needs to be done is closely tied into how effective the tools are. Despite the great advancements in battery technology they don't have the longevity that a gas machine does and when you do run out of power it may take a couple of hours to charge. But the testers both lawn care professionals and homeowners do agree that for most household lawn care jobs electricity will get the job done just as well as gas. I personally don't have any gas powered machines and I have found that I don't miss them at all. I use a Earthwise Cordless trimmer for all my weed whipping needs and I am quite happy with it. For mowing the rest of the lawn I use a 16 inch Earthwise reel mower that does a fantastic job and is easy to store. But the true effectiveness of a lawn care machine is really up to you the consumer. You must properly asses your needs and purchase your tools accordingly. If you have a inadequate tool for the job then you will inevitable be unhappy with it effectiveness. For me electric is the only way to go when you want good lawn care for minimal impact on the environment. I have been using one of these for about a month now and I just love it. It works great for my small yard and is very light and quiet to use. But if you have a lot of weed whipping to do you will most likely want a couple batteries on hand.